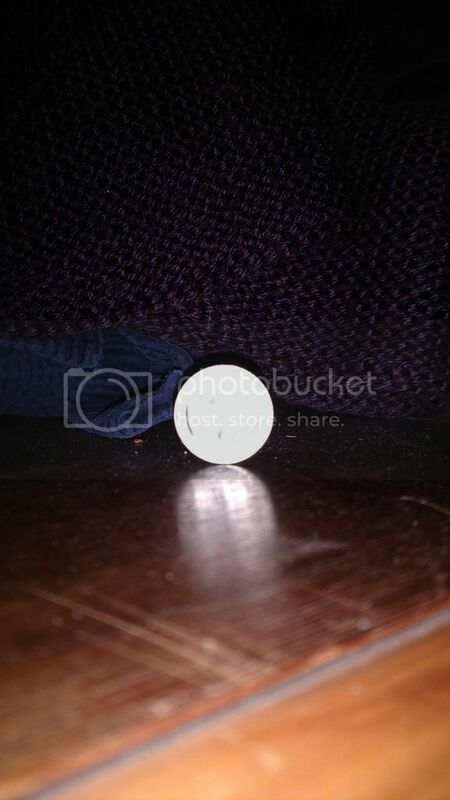 Woke Up To Quarter Mysteriously Standing On Its Side On Box Next To Bed, Balanced Now For A Few Days, Freaking Out. two days ago i woke up to a quarter (25c piece) balancing on its side heads facing me straight on on a large yellow box pretty much next to the bed. I woke up my partner both of us freaked out as neither of us placed it there, especially in such a position. Weirded out by said coin neither of us have not touched it and have gone about normal activities in the area, including putting down and picking things up of the box, the coin has not moved, AT ALL. Is anyone aware of any superstitions or legends, etc related to quarters...quarters balancing on their sides? 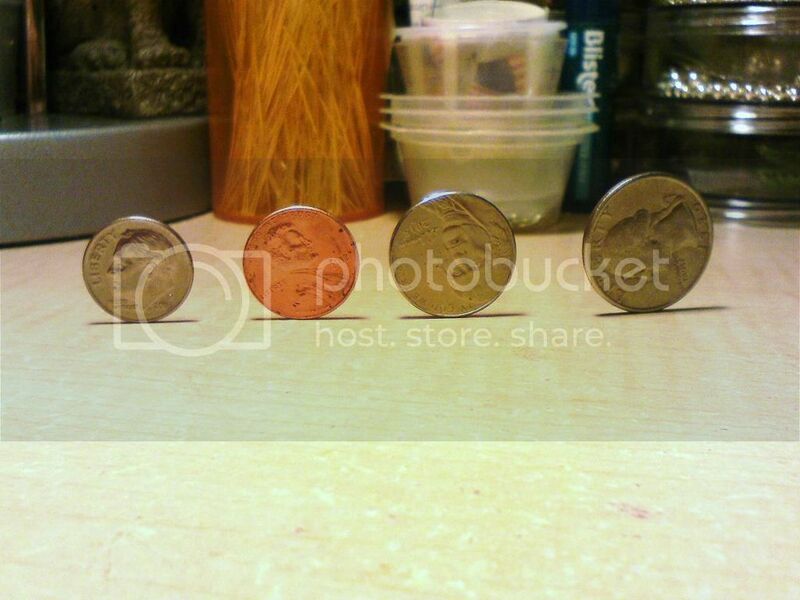 Coins balancing on sides? i've tried to google but haven't had much success. As a back story on the house, my partner and i moved into this house 2 months ago and have experienced some strange activity around the house that started about 2 or so weeks after we moved in. its just the two of us living in the home. We have both heard noises regularly, sounds of someone walking down the stairs and even voices on a few occasions. I have also seen unusual shadows of movement around the house and on one occasion saw from the lounge room through the doorway a large shadow move quickly across the bedroom (in the corner that the box is in) although the majority of the activity seems to occur in the bathroom and stairway. Both my partner and myself have lived in homes that definitely would be considered to be "haunted" and such activities don't really bother us unless they feel malevolent, BUT THE COIN THING IS BIZARRE. Edited by sophieisscared, 05 February 2017 - 05:59 PM. The coin is It's formal introduction... is my best guess. And if that's the case, you'll probably be seeing a lot more activity. Try no to freak out or show much interest or fear. It wants to see you're reaction.... so don't give it much of one. So why didn't you put it back down? I'm inclined to think your partner is messing with you. It's pretty easy to stand a quarter on edge and they stay pretty well. Go spend it and don't worry about it until and unless something happens that's clearly something someone in the house couldn't do. The coin is It's formal introduction... is my best guess. And if that's the case, you'll probably be seeing a lot more. thank you for responding jim@GhostStudy, you're probably right. As i have been thinking about things, i have on a handful of occasions felt completely unexplained and unprovoed feelings of extreme sadness and a feeling i can only explain as disturbed that seemed to occupy my mind when spending long periods of time in the room. One time that stands out happened a few weeks ago and only lasted few minutes I hadn't been in the room long at all, it was the early hours of the morning and incredably intense. Its not a feeling of something bad in the room but a bad feeling that randomly overpowers me and isn't provoked by anything and only in this room??? I dont know if this even is anything but thought i may be worth mentioning if it as you say is the formal introduction of some sort of spirit? As i said before paranormal activity never really bothered me, i have always had a sensitivity to the paranormal, i have just found this quite regular activity around our house coupled the feelings i just explained and then followed by this weird coin scenario odd and that it is trying to make its presence more "obvious" I'm worried its something negative. Tantric KittenGStudy, thanks for your response. I don't think so, I know my partner and i know when hes messing with me, hes definitely isn't, he is genuinely freaked out. I haven't moved the coin as i come from a family of immensely superstitious gypsy's and such an upbringing has resulted in a certain, superstitious paranoia. i want to try to be somewhat informed in case it is due to the paranormal before i touch the coin. Edited by sophieisscared, 05 February 2017 - 07:38 PM. Hello and welcome to the boards. I thought coins were meant to be from a deseased loved one and it was their way of letting us know they are thinking about us. Leaving it gives power to any possible entity. It signals that you think it has more authority than you do and that you're going to passively accept whatever it does. In any case I don't think that's a good idea. I don't advocate being confrontational unless you can communicate and have a good idea of the actual risks. But I also think it's extremely important to remember this is your life, your body and your space and you say what happens in it. Klainey, the "pennies from heaven" phenomena did occur to me after I posted. I thought about suggesting before it's spent to check the date on it but I feel strongly that a living person and deception is behind this (maybe not her partner but someone) so decided against coming back and saying anything. 2. Or is it just you two living there? 3. And lastly, are you renting or buying? It doesn't seem to sure about sharing the house with you. Can you tell us anything about the history of the house before you moved in? It's fine to be brief. For example. A family of 5 were living there. It may even be pouting because it misses the last tenants. If that were the case, you may need to look up the previous tenants if you don't already know them. They may actually have a wealth of information concerning all of this. We have to at least consider that possibility, right? I have over a thousand quarters in my closet. So far I can't get any of the ones I tried, to stand up. But maybe I need a brand new one. The quarter isn't glued there is it? At some point, you may want to see if you can make that particular quarter stand up on it's own just to see if it can be done. I always took money appearing where it shouldn't be as a bit of a sign of bad things to come. I can't explain where this idea came from, although I suspect its from my research on poltergeists. Sophie, I think its' interesting that you come from a gypsy background. I don't know much about your practices, but are there traditions you usually do when you move into a new place? Did you do these when you moved? Eg Christians might have their house blessed etc. Jim, it takes a light hand. Hold the quarter on edge with your index finger and thumb just barely, then let it roll along on edge until it "settles" (you will feel when it's balanced and it's impossible to describe how it feels when it's balanced). Carefully move your hand away and once you have it's fairly stable. You can't knock the table hard but you can more or less go about your business and it won't fall over. I used to balance coins all the time I don't know why. I used to balance my wedding ring, too. I fell out of the habit when this ring won't balance except on the stone. Edit: I just did it with the first quarter I grabbed and took a picture of it to show it can be done but photo bucket is so spammy lately I can't upload it without it kicking to one of those stupid scam sites. Cool accept your attachment isn't working. Thanks for the tip, Tantric! Weird. The photo is there for me. But yay! Now you're going to be addicted. Yeah... I'll probably go out and try balancing a skateboard on a stop sign ....and even a shovel on top of the chimney! Who knows what this will lead to! And no, your attachment is still not showing up... I guess I'll have to take your word for it. Hey, I see it now, Tantric... cool! This balancing thing is kinda fun. Sorry, Sophie... we'll try and get back on tract now. And please let me know what you think about the previous tenant theory. I saw a video from an investigation (I posted it here some time ago) where quarters were falling from the basement ceiling. Very creepy. Can I put my 41¢ in? I am of the opinion that coins can be a sign from a crossed over loved one. I use to find dimes, which I think my dad left. Went into Walgreens and came out and 5 dimes were lined up on my dash all in a row. Ran the sweeper, went in the other room, came back out and dimes were scattered all over the floor. I found them in my shower, in my bed, and at the time I lived alone. We find pennies a lot. Once, while she lay dying, we found one under my Aunt's bed. I know it wasn't there when we came into the room. Shadow, I've heard about that before too, does anyone have experience with money showers in relation to poltergeist activity?